we have 2 wonderful books as giveaways! so book bloggers will no longer be automatically included in this giveaway. I would love to read From The Fifteenth District as it sounds like my kind of book! I’m a sucker for all things French. The book that appeals to me most is From the Fifteenth District. 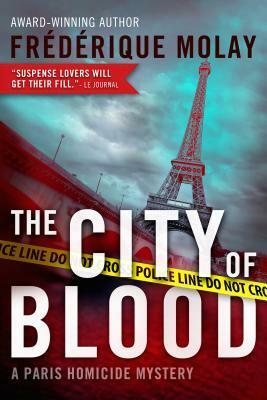 Both are great books, but I choose The City of Blood, since it is a mystery and a darn good sounding one at that! Also, it’s the only one I can choose, since I am not American. A shame, that Canadians can’t win a book by a Canadian author! lots of readers interested in this one! I think I’d prefer the murder/mystery, The City of Blood. Thanks. Happy New Year!!!! I would like to win The City of Blood. I am in the mood for a good mystery to start off the year and it being set in Paris is a bonus. and you will want to read all the books in the series, so good! Both books sound like interesting reads. I ‘d choos From The Fifteenth District. It sounds a little bit more like the books I would enjoy. Thank you for the chance. Happy New Year. so which one would you choose, and why?